Lighten Up With This Yoga + Ayurveda Mini Cleanse! So you're feeling a little less than shiny and thinking it might be time to clean up your act? If you're looking for a simple way to lighten up, nourish your mind and body, and rid yourself of a few toxins in the process, consider giving ayurvedic cleansing a try! Cleansing is an ancient tradition and a key part of the ayurvedic approach to living. Seasonal cleansing is highly recommended for deep and long lasting results, but you can build simple practices into your routine as a form of “maintenance” – especially if you're feeling heavy, foggy, or just a little out of sorts. Ayurvedic cleansing is all about strengthening our ability to digest stuff (food, thoughts, emotions, information). It's a simple, holistic approach to detoxing that is actually enjoyable! There are various ways to cleanse but you can experience real benefits from just a single day of what Ayurveda calls langhana or “lightening up.” I call it “mini cleansing,” a one or sometimes two-day detox, and it goes a little something like this. Get up early – Preferably before dawn. Make sure to get plenty of sleep the night before. Drink warm water with lemon – This helps to kick start your digestion. Breathe and listen in – Use breath awareness throughout the day to anchor yourself to the present moment and ease mental and emotional chatter. Make a commitment – Take a moment to consciously choose how you will engage in the day to support feeling lighter in your mind and body. Start your day with mindful movement and use the practice to reinforce your intention to lighten up! 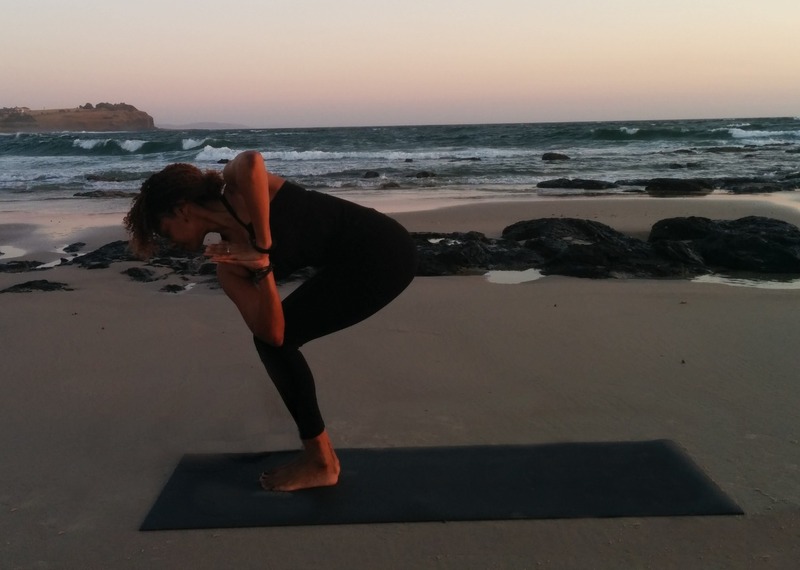 Try this sequence of poses that focuses on activating the digestion and internal organs. This is a gentle warming sequence that works into every part of the body (I love this one!). Practice tips: From child's pose, inhale and move forward through cat pose. Continue moving forward exhaling as you lower to your belly. Inhale to baby cobra, lift the heart, and roll the shoulders back. Exhale as you draw the hips back to child's pose. Synchronize the breath with the movement (imagine you're a wave – rising and falling, drawing back out and returning). Focus your attention on the breath, and when you're ready, add the mantra! Take 5-10 rounds finishing in downward dog. Cleansing mantra: I am opening my body and mind to the flow of life. Practice tips: Draw the shoulder blades together down the back. Lift from your center,sit bones toward the sky for added lightness. Keep the weight evenly distributed on the feet. Try 4-8 deep Ujjayi breaths on each side, and add the mantra when you're ready. Option: Bend the knees and shake the hands/arms out as you return them to the floor. Letting go: Release thoughts and tension down the arms and legs into the earth. Cleansing mantra: I am releasing what doesn't serve me. 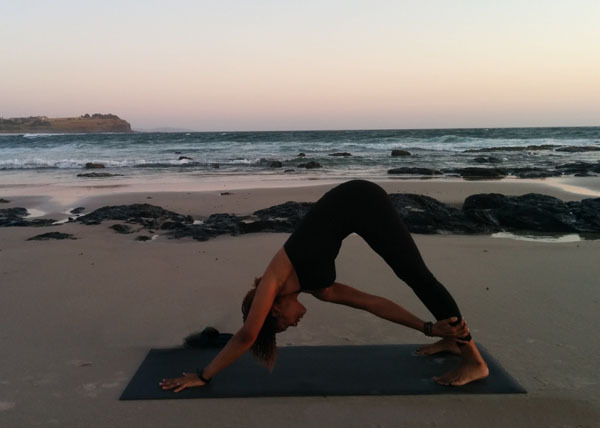 Practice tips: Begin in a forward bend with your feet together. Bend the knees a lot and distribute the weight of the body evenly over the feet. Inhale reaching arms forward, exhale bringing palms together into the twist. Soften the gaze, shoulders, and tailbone gently down toward the floor. 4-8 deep Ujjayi breaths on each side. Add the mantra when you're ready. Option: Extend the arms, bringing the hand to the floor or block, and gazing up or down. Letting go: Release tension from the top of the head and the back of the neck, out across the collar bones and away from you. Cleansing mantra: I am energized, expansive, and radiant. 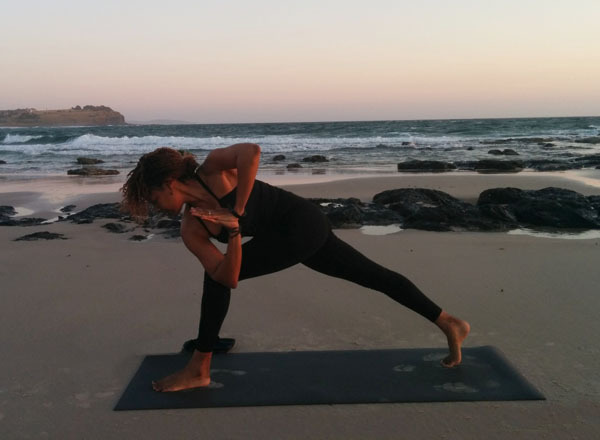 Practice tips: From chair pose, step back to high (or low) lunge. Press out through the left heel while grounding through the right foot. Broaden across the shoulder blades, working your thumbs toward your heart center (this may need to happen over time). 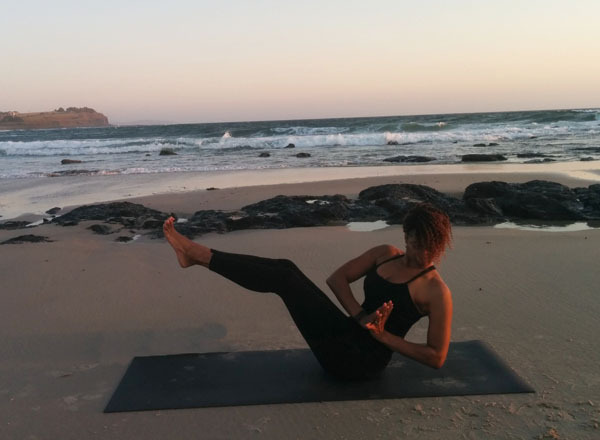 Focus on lifting and extending from your navel center. Option: Drop the knee down for low lunge,and open the arms, bringing the hand to the floor or block. Letting go: Release tension and emotions from the lower body down the legs and into the earth. Soften the top of the head and the muscles of the face and neck, allowing the tension to release across the collarbones. Cleansing mantra: My mind and body are clear and light. Take child's pose here for 5-10 breaths or practice 4-5 gentle rounds of cobra flow. Practice tips: Come to seated position and bend the knees. Bring the hands together at the heart center and lift the heart. Engage the belly, press your hands together, and broaden across the collarbones as you twist to the right side. Hold for 3-4 breaths before shifting back to center for 1 breath, and then to the left side, holding for 3-4 breaths. Letting go: Release tension from the entire body down to the sit bones and into the earth. Allow tension from the face and neck to flow out across the collarbones and away from you! Cleansing mantra: I am balanced and peaceful: mind, body, and soul. Stay focused on lightening up over the course of the entire day. Eat light – Enjoy light meals (especially breakfast and dinner). Stick with fruits and veggies, soups, kitchari, and warm lemon water or tea. Take it easy – Move through your day in a light and easy manner (remember to breathe). Keep information and activities to a minimum. Have a restful, relaxing evening and enjoy time with loved ones. Be mindful of the impacts of this cleansing ritual to your mind and body. And before going to bed, take a moment to feel the effects of your day, your choices, and your experience of lightening up!